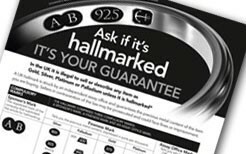 Hallmarking is necessary because when jewellery and silverware are manufactured, precious metals are not used in their pure form, as they are too soft. Gold, Silver, Platinum and Palladium are always alloyed with copper or other metals to create an alloy that is more suitable to the requirements of the jeweller. Such an alloy needs to be strong, workable, yet still attractive. Owing to the high value of gold, platinum, palladium and silver, there are significant profits to be gained by reducing the precious metal content of an alloy at the manufacturing stage. Base metal articles plated with a thin coat of gold or silver look the same as articles made wholly of precious metal, at least until the plating wears, and even an expert cannot determine the quality or standard of precious metal items by eye or touch alone.